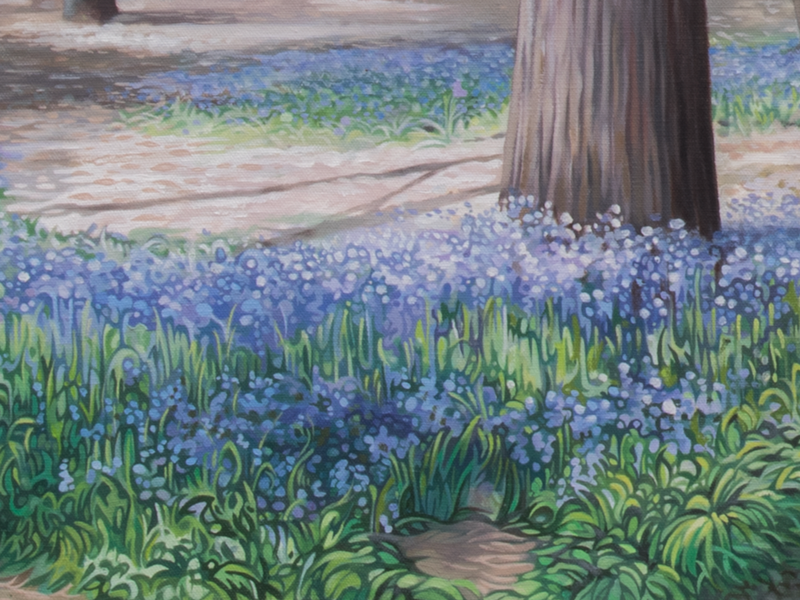 The Bluebell Wood is a large work investigating the subtle colours of a section of woodland, interspersed with bluebells. The Bluebell Wood is taken from a walk I took in some woods near Marlborough at the peak of bluebell season. I hadn't intended to be out for the day, in fact I had been out and about visiting a gallery. But as I drove along the tree-lined road, there was a bright flashing of that familiar violet colour. Naturally, I pulled over, ditched the car and headed into the woods to investigate. The reward was well worth the effort as I was soon surrounded by a carpet of bluebells and the subtle accompanying frangrance. This is a super large painting, weighing in at 50cm deep by 1 meter 45cm wide. A painting this size naturally incurs more time to complete. I have had several passes on it since I first started it, to the point where it has matured into a rather large and details work. Nevertheless, it has been a pleasure to work with at every stage. I love the feel of this painting as I think both in colour and composition it ticks the boxes. I think the colours are gentle enough to allow the size of the painting to work and not to become overbearing. All in all I look forward to this painting finding a home that has room to accomodate it and will be extremely sad to see it go.